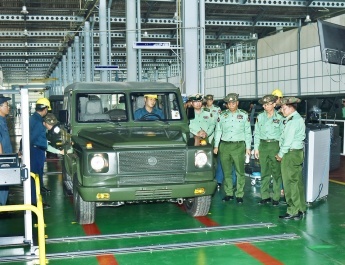 Commander-in-Chief of Defence Services Senior General Min Aung Hlaing, accompanied by his wife Daw Kyu Kyu Hla, Commander-in-Chief (Navy) Admiral Tin Aung San, Commander-in-Chief (Air) General Maung Maung Kyaw, senior military officers of the Office of the Commander-in-Chief (Army), the commander of Triangle Region Command and officials, visited replica Shwedagon Pagoda in Tachilek this afternoon, viewed making of the stone inscriptions of Pitakas (The Three Repositories of Buddhist Scriptures) and set up inscriptions. 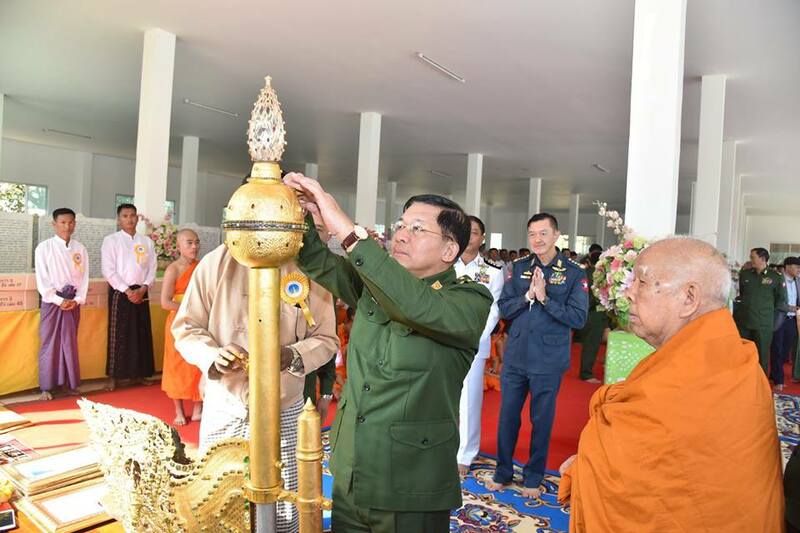 The Senior General offered gold foils to the diamond orb of Tachilek Shwedagon Pagoda, and paid homage to the abbot of Naga Hnakaung Monastery State Ovadacariya Abhidhaja Agga Maha Saddhammajotika Agga Maha Pandita Bhaddanta Dhammasiri.The Senior General, his wife and party received the Five Precepts from assistant abbot U Sudhamma of the Naga Hnakaung Monastery. The Senior General and wife donated offertories and cash for nine prerequisites to the abbot. 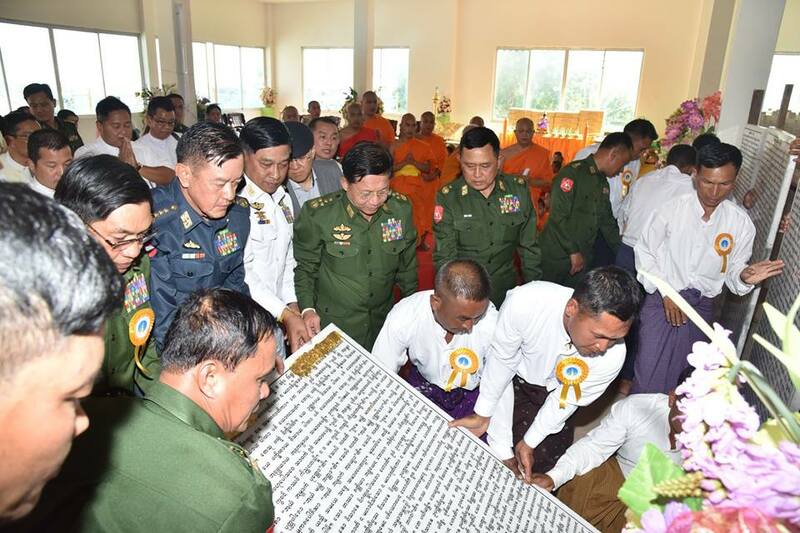 The senior military officers and the congregation offered offertories to the Sayadaws and members of the Sangha. 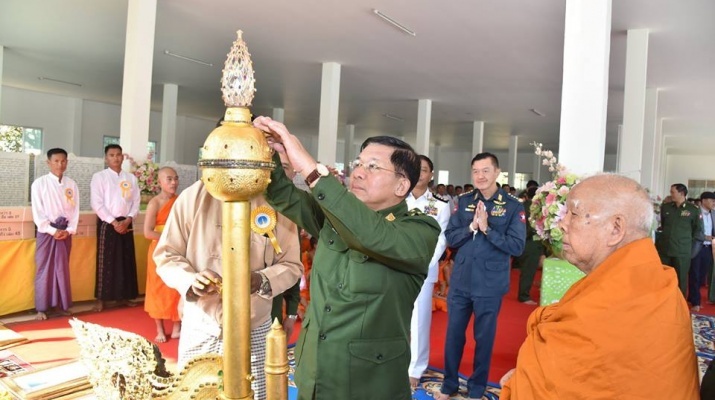 Sayadaw U Sudhamma delivered sermons and the congregation shared merits gained. 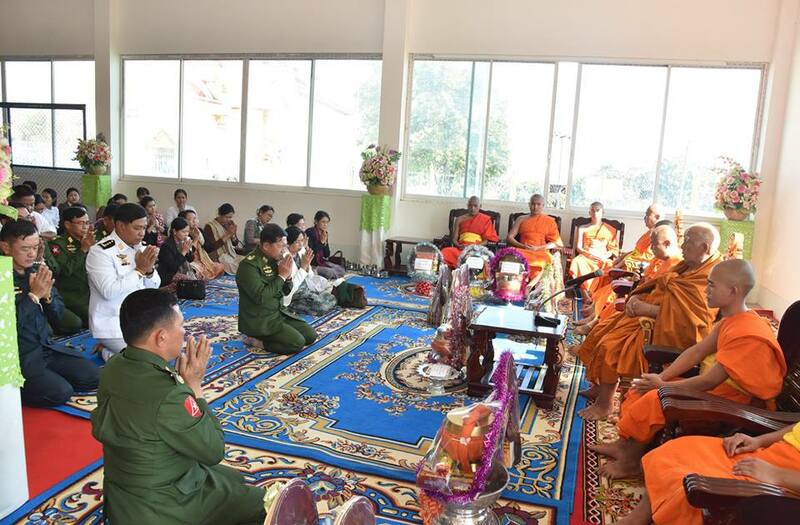 The abbot of Naga Hnakaung Monastery presented Buddha images to the Senior General and party as Dhamma gifts. 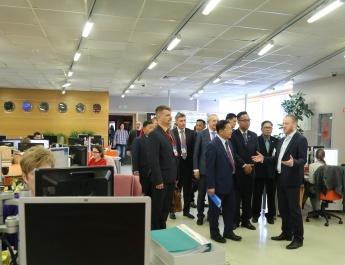 The Senior General, his wife and party offered gold foils to the stone inscriptions being carved on the premise of Tachilek Shwedagon Pagoda and set them up. The Senior General and party then hoisted the diamond orb and pennant-shaped vane atop the pagoda. Under the aegis of the abbot of Naga Hnakaung Monastery and with the contribution of members of the Sangha and people from all walks of life, the Pitakas delivered by the Lord Buddha have been translated into Gon Shan ethnic language and carved on stones, and stone inscriptions have been set up on the premise of Tachilek Shwedagon Pagoda as of May, 2012. So far, around 320 stone inscriptions have been set up and the remaining inscriptions will be set up when carving is complete. 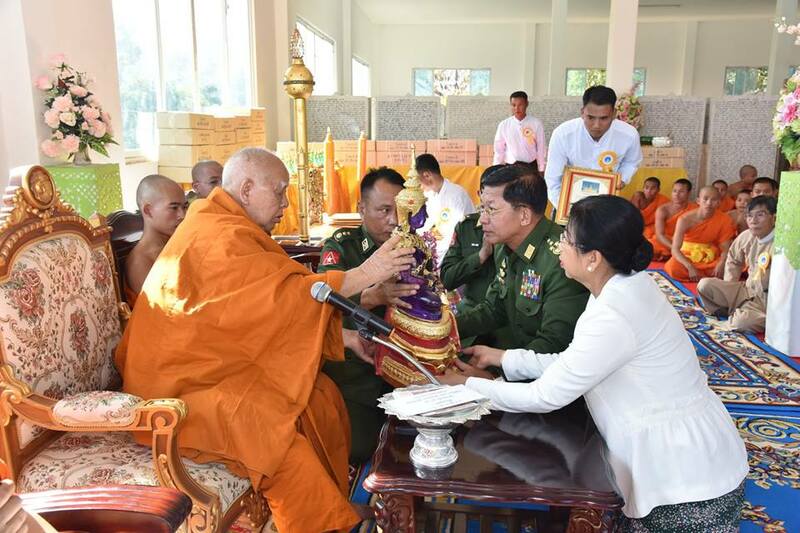 The Senior General, his wife and party then paid homage to Presiding Sayadaw of Maha Myat Muni Phayagyi Monastery in Tachilek Agga Maha Saddhamma Jotikadhaja Bhaddanta Pannasami and donated offertories and cash to be spent on nine prerequisites.